Alvarado Street Bakery is a certified organic bakery specializing in sprouted whole grain breads and bread products. I'm not such a fan of their low glycemic sprouted grain bread, as for me, it the texture is just too dry and grainy, but I love their regular sprouted whole wheat bread, which is still sits decently on the glycemic index. Given the recent dietary suggestions I received I am trying to add some more carbs. In order to be okay with that, I have to make sure I find the best "good" carbs possible for my body. 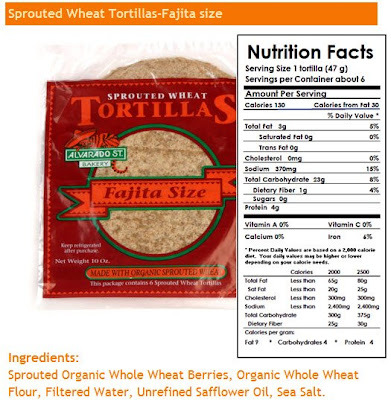 So I was very happy to find Alvarado Street Bakery's Sprouted Whole Wheat Tortillas. I'd been using the La Tortilla factory tortillas and I like them okay, but these I really enjoy the taste and texture of Alvarado's better. They're have more of a traditional tortilla texture. When heated, they don't get all gooey and rubbery like the La Tortilla Facotory's tortillas. The Alvarado tortillas stay moist, but not wet. I haven't tried any of Shelly's awesome pizza varieties yet, but I've used them for a breakfast burrito (egg, canadian bacon, lowfat cheese), as a replacement for sandwich bread at lunch and for quesadillas -- they are yumm-o! The other thing I appreciate is the fajita size. It's really hard (in my area at least) to find La Tortilla in the smaller, fajita size. The burrito size is just TOO big -- and while it should be a PITA to cut them, it is (PITA; get it? It's a bread pun) LOL I've only seen the Alvarado's in the Fajita size, so no need to sharpen the knives in my house!